For vast majority of full-time wanderers, a life on the road means owning and largely living in an RV. Recreational Vehicles afford us the most opportunity to move around as we please, with the least amount of planning and at the lowest cost. Wherever we go, our home is there. If we choose some other type of situation for a time, that home still exists. Should economic hardship shower us or the world as a whole, we have an easy way to exist and subsist, if not thrive. And really, one of the greatest things about RV living is that you’re afforded some amount of the comforts of your own house while always calling somewhere new home. 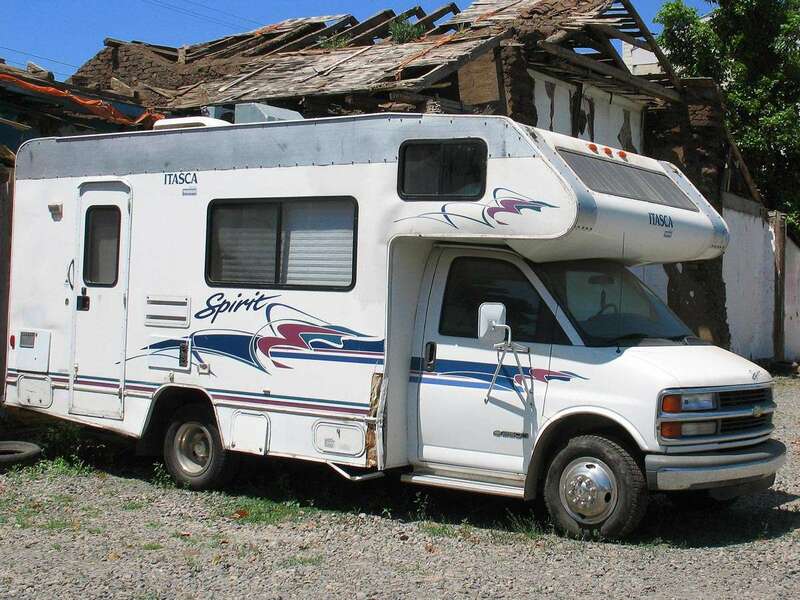 The term “RV” however, is broad at best. Motorhomes, travel trailers, campervans; there are not only a variety of classifications, but a multitude of lifestyles that can be lead through careful decision. Whether you’re a minimalist seeking solace in your daily hike through pristine wilderness, using your van solely as respite from your adventures to the savviest techmomads eager to see the sights as they trolley around this nation in absolute comfort, we’re all explorers, all with our own unique approach. To understand the differences between a 5th Wheel and a campervan, a trailer or a school bus–particularly for anyone who’s never owned or even vacationed in an RV–can be a bit daunting. Translating a life in a house or apartment, mansion or double-wide trailer to one on the road can feel about as easy as translating hieroglyphs into baby talk. Let’s see if we can simplify. What follows is an account of the various types of living on the road. We are in no way attempting to judge anyone’s particular mode of travel. As far as we’re concerned, anyone who’s out living their dream of full-time travel is a-okay. We wish you happy trails and would never scoff at the chance to exchange stories over the old gas pump, regardless of what sits atop your wheels. Forgive me if the tone of this article goes a bit salesman. I would don my best leisure suit and offer you a cup of coffee, but the intention here is not to persuade, but to absolutely and strictly inform (accompanied by some hopefully humorous but personal experiences with each variety of vessel available, of course). A living space plus an engine, all in one vehicle, is a motorhome. Often a colloquialism for all “RVs”, imagine your bed, kitchen and living room smacked right up against the front two seats. If you’re driving, your husband can remove his seatbelt, head into the kitchen, and cook up a mean meatloaf. Theoretically, anyway. Legally, not usually. A motorhome can be the ideal way to begin a life on the road. It can be easily the cheapest way to get started and the most expensive, the most rugged or lush. “Motorhome” is also the broadest of all terms we’ll use today, and so let’s dive into the possibilities of what these completely independent homes on the road can entail. All motorhomes fall into one of three “classes”. Even hippies who loathe the idea of the man putting labels on them know that motorhomes look different at first glance. It’s not a thing with them, it’s not “like that”. To be exact, there are three classes of motorhome: A, C and B.
Strangely, that is the apparent order they should be announced. Class As are the largest, kind of like tour buses. Like Willie rides in. 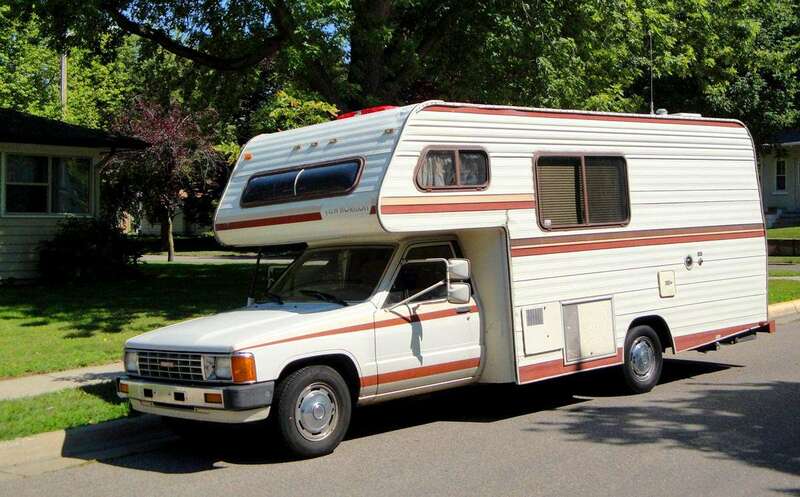 Class Cs are your typical motorhome, with a normal van chassis and a bunk above the cab. 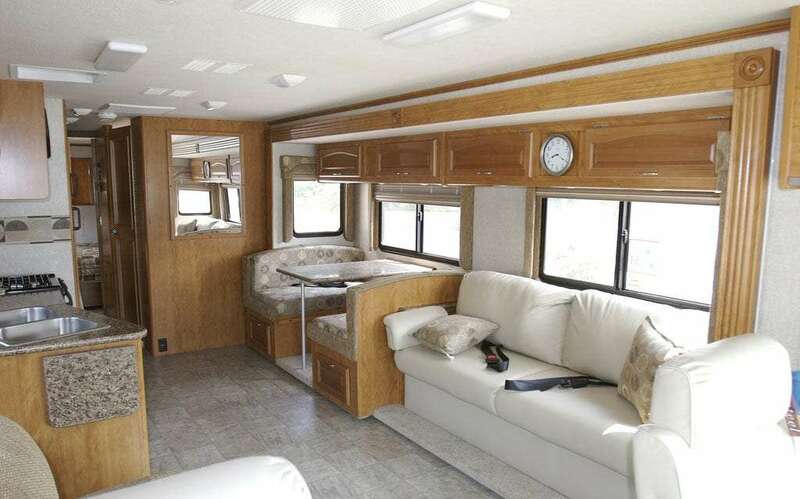 Class Bs are essentially campervans, the smallest of the motorhome classes, though they can get quite lavish. A “slideout” is where part of an RV’s exterior walls can be made to extend outward, creating more space inside. It’s fancy livin’. 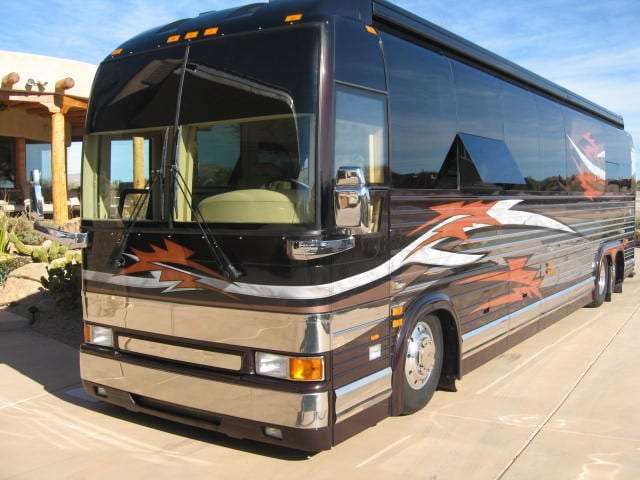 Picture a Greyhound bus, or Ozzy Osbourne’s rig. They look like actual buses, a big window in the front, everything else behind. Lots of storage outside, likely a ton of slide-outs. Class A RVs are the biggest deal on the road. They scream of importance, seemingly fear nothing of the sway a tractor trailer on an 85mph freeway might threaten, and one wonders how they manage to ever find their way off of the Interstate. 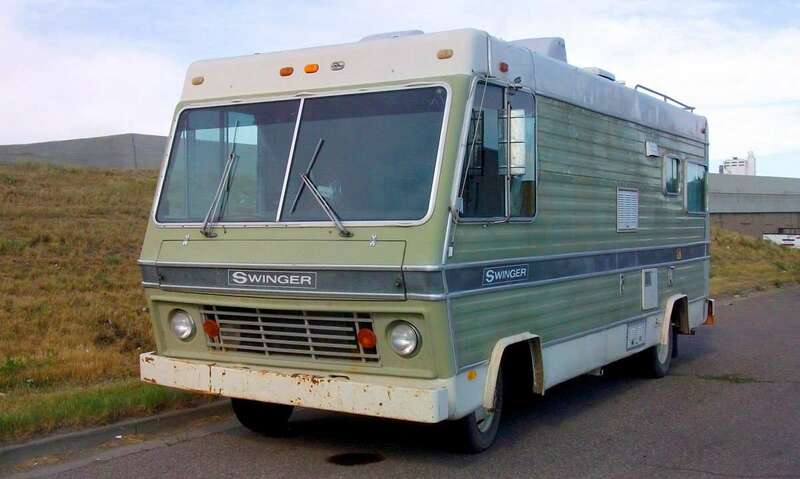 You don’t see many used Class As on the road (save for old Bounders and a few killer Winnebagos from decades long gone). They often boast dark tan paint jobs with Nike-style swooshes each one longer than most lines waiting for a new iPhone. The interior tends to leave folks agape upon first entering one of these big boys, and I have personally found myself afforded the experience to hear a man’s wife calling him from the back of a Class A at the top of her lungs, yet her shouts were as muffled as a catcher’s chaw spit in the ear of a shortstop. 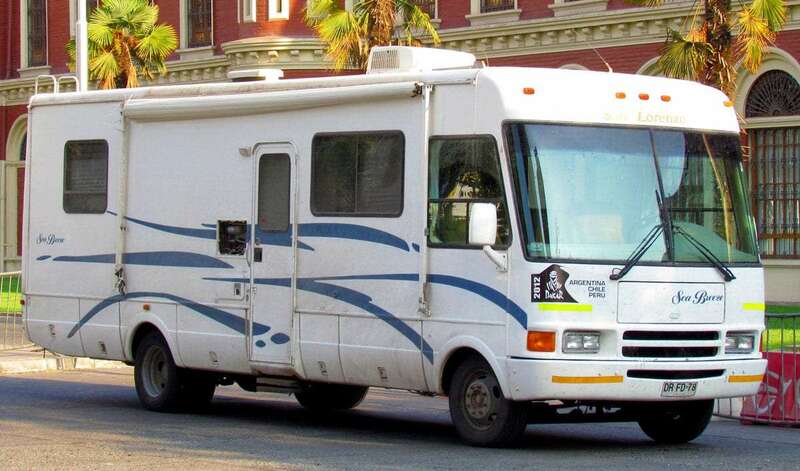 Example of a Class A RV. Photo courtesy of Wikipedia. Roomy interior of a Class A motorhome. Photo by Apollo Elite Traveler. We call them Rockstars around here, they ooze a sensation of rich, of wealthy, and of having enough space to lounge around without throwing a hip out. Many a retiree will find themselves using a Class A as though it were another comfortable couch to lounge around Must See TV all night. Not that we’re judging, but damn, I’d love to actually see a rockstar walk out of one some night. 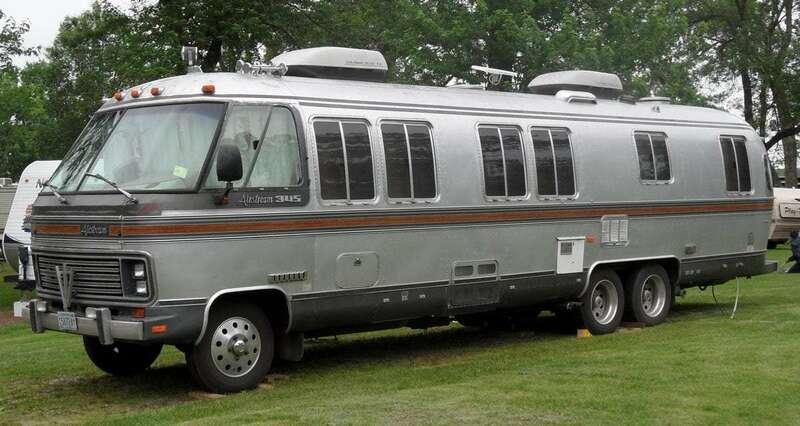 As for cool, old school Class As, Google vintage GMC motorhome. Original advertisement for a GMC MotorHome, one of the more common vintage Class As you’ll see on the road still today. Yes, Class C trumps Class B. Class Cs are those which are built typically on a van’s chassis, so that the front of them looks somewhat like a van or pickup truck. Ford E-350s, for example. They’re most recognizable by the way the roof of the RV’s body extends over the cab where the driver and shotgun passenger reside during travel. They’re cheaper than Class As. Another way to spot them is merely by the lackluster dull of the majority of their sides. Like tissue boxes lines up in a driveway, most commercial RV parks will be primarily stocked with Class Cs. They’re typically significantly smaller than a Class A, but can be huge indeed, and the storage is similar but proportional: lots of compartments outside for everything from sewer hoses to possibly TVs or grills, and a small trailer park trailer’s worth of closets and cabinets. Form personal experience, I began my own travels in a Class C. It was ugly, and it was cheap, and it got the job done quite well. From a practicality standpoint, Class Cs offer the best balance of affordability, space, and minimal overhead. Did I mention how ugly they are? If you’re interested in “different and/or vintage” in the Class C range, Google Toyota dolphin. Typical Class C RV. Photo via Wikipedia. For whatever reason, B is less than (but in our minds far more equal to) C.
Campervans range the gamut from Roadtreks with showers and toilets to vintage Volkswagen Buses with their pop tops and hippie flare. 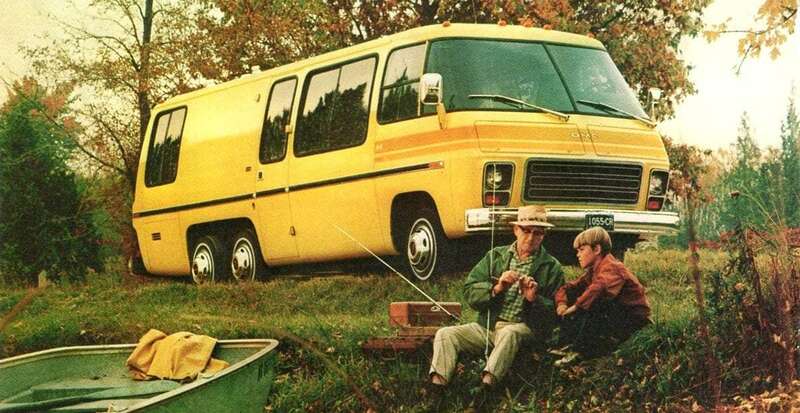 There may be a technical difference between a “Class B RV”, such as a Roadtrek or Airstream Interstate, and a campervan, which could probably even include conversion vans, but it’s all in the family. Class B RVs combine a more realistic everyday driving vehicle with minimal space in the back to live. I’d like to think that by practical definition, they at least include a bed, sink, stovetop and refrigerator. A bit of storage and maybe some killer neon red track lights. They beat out Class As and Class Cs in our opinion, because you don’t need a tow vehicle. They can also fill up at almost any gas station. But you have way less space. Finally, people really get into converting school buses into motorhomes. While these would technically be considered Class As, they don’t make the same cut. I guess it’s because owners of Class A motorhomes are giant rich snobs who either make or own record labels, or the fact that we’ve run into a few campgrounds that downright ban school buses altogether. Either way, school buses rock and are the ultimate way to completely 100% kit out your RV lifestyle however you want. Certaintly, it would take some know how in the fields of automotive repair, electrical work, plumbing, HVAC, and carpentry, at a minimum, but if I was ever in a situation where I had the time, knowledge and a lack of eagerness to hit the road right now, I would kit out a school bus so hard I don’t think there would ever be a highschool dropout in any town in any state we’d ever visit again. Seriously, it’d be that cool. A Toad is something Class As & Cs pull behind as a way of driving shorter distances without tearing down your house and driving it into town. If you’re living out of a motorhome, you will likely also need a toad, an additional vehicle–typically a car–which is small enough to drive from your campsite to town, attractions, etc. So the biggest downside of choosing a motorhome is that you’ll need to purchase and maintain two vehicles with engines. My first year on the road, I lived in a Class C and relied solely on bicycles to get around towns and national parks. It meant more planning ahead–finding places that had RV parks within a few miles of the things I wanted to do, and getting grocery shopping done before setting up the RV–but it also meant that I got to do a bunch of cycling around really great places. For everyone, that may not be a reality, and it does limit where you can go, or at least where you feel like going after realizing your campsite is at the bottom of a very steep, four mile hill. On the other hand, if you can get by with a setup like that, you have less expenses initially than combining a trailer and the truck to pull it. Theoretically, motorhomes can also be used while traveling. Cooking a meal while you’re headed down the road might not be the greatest idea (pans flying out of opened cupboards tend to leave a healthy bump), but my oldest son sat at the dinette and was able to color or play with toys at the table as we would overland from destination to destination. Taking a nap in the bed, again maybe not the safest idea, is certainly a reality. I picture old grannies knitting in their captain’s chair as pa drives on down the highway. Or maybe hubby lounges out on the couch watching a movie while his lady friend mans the wheel on a long morning drive. Not to be confused with what you see in a trailer park, a travel trailer is an engineless mobile unit that is pulled behind a truck or van. They often have all of the amenities of motorhomes, but without the autonomy of an attached cab. Committing to a travel trailer means you’ll be able to leave your home parked somewhere, unhook your two vehicle, and drive away off to your next adventure (or to the grocery store). A Tow Vehicle is a truck, van–or more rarely a car–that is hooked up to a travel trailer and used to propel it forward. Essentially all travel trailers share the same basic idea behind what they actually consist of: some type of rectangular box full of your life. However, there are a few different options which can drastically affect how you’ll use yours, and how versatile they’ll leave you when it comes to where you can go and how easily you can get there. Fifth wheels are the big dogs of travel trailers. They can be as large or even larger than Class A motorhomes. The defining element of a fifth wheel is that, instead of hooking up to a hitch near the bottom of your tow vehicle, they do so in the bed of a pickup truck via a special type of hitch. Therefore, you must use a pickup truck as your tow vehicle (as opposed to a van or car). This isn’t necessarily a limitation, and trucks are easily the most common type of tow vehicle, but if you were planning on using a van for storage or were really hoping to tow with your VW Touareg, fifth wheels aren’t for you. A Wet Bath is a bathroom where the shower & toilet are combined into one room. You put the toilet seat down & the shower pours water over you & everything else in the room. 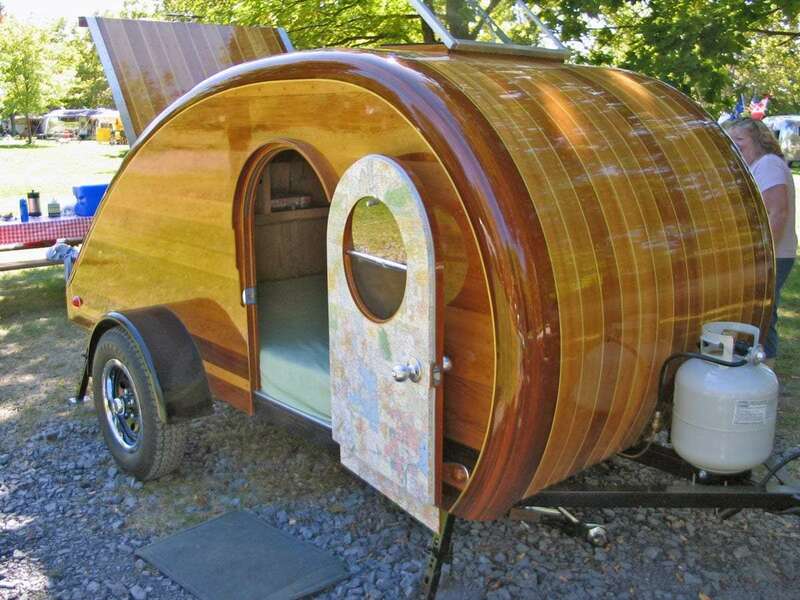 At the opposite end of the spectrum, teardrops are typically the smallest available trailers. They’re called teardrops due to their shape, and not all have every amenity of the average trailer. Your shower may be a “wet bath”, or there may be no shower or toilet at all. There are a plethora of different manufacturers of teardrops, especially if you count all of the vintage models available. 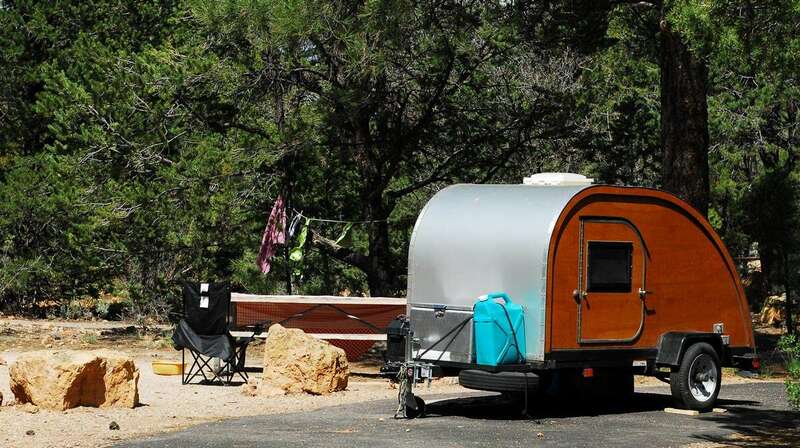 With a teardrop, you’re opting for less space in exchange for a smaller footprint, meaning they’re easier to tow around than a fifth wheel or other large trailer, and you can often fit into more rustic spots at campgrounds (like in the tenters section, which is typically more wooded and beautiful than an RV parking lot). Though not technically teardrops, these are another type of small trailer which are easily towed–many times even by a car–and offer the same flexibility of where you can go and ease of driving that teardrops do. T@Bs have no bathroom, T@Das do, but they were made by the same manufacturer in the 2000s–Dutchman–before production halted. Another company purchased the rights to the brand, and are now manufacturing T@bs again. They kind of look like Lego trailers, and have garnered a descent little following of dedicated fans. The new manufacturer has even created a smaller version called the T@G.
Casitas and Scamps share a similar look: white, rounded and reminiscent of an egg. Made of plastic and with limited space inside, when I chat with their owners they’re typically very happy with these little trailers that can be easily towed by a car. A variety of trailer all unto themselves, popups are defined by being very small when not used, and then expanding via tent-like “popups” to create more head space and bedrooms. I have never known anyone who actually lived full-time in a popup and considering the insulation is equivalent to a tent, and the storage somewhere between wagon and suitcase, they seem quite unrealistic even for the most minimal of us. Perhaps if combined with a van that provided storage space, they could be a realistic option, and certainly they are cheaper than most any other type of trailer, but something about them just seems rickety and ill-suited to being called a home on the road. 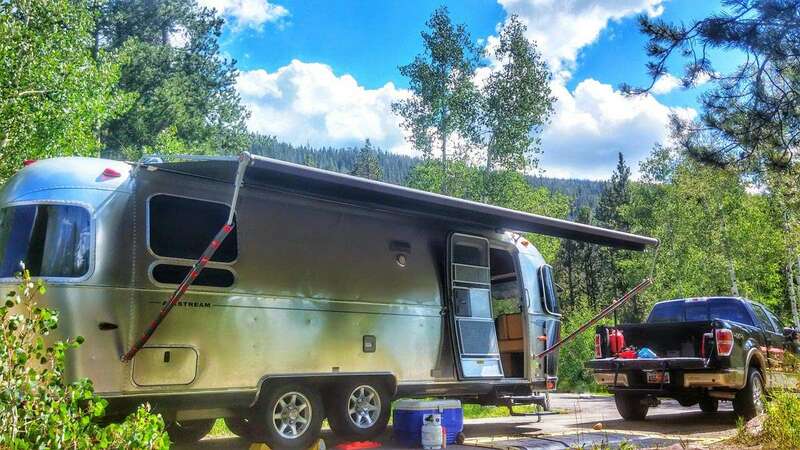 Most of the silver aluminum trailers, whether brand new or vintage, that you see moseying on down the road–often in caravans of ten or more–are Airstream travel trailers. Known for solid manufacturing in the United States, or just for being an icon of American travel culture, they enjoy a viciously devoted following similar to Harley Davidson owners. 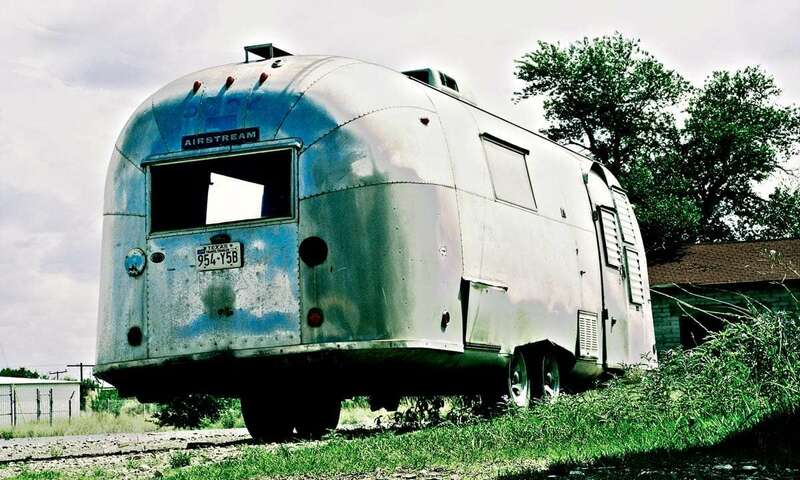 Airstreams can be nearly as small as a teardrop–the Bambi–or triple-axled, 34′ behemoths. Due to their rounded nature and relatively small size compared even to a standard trailer, Airstreams have less space inside, and relatively no storage outside (when compared to motorhomes, fifth wheels and average trailers). They are often more expensive than other brands of trailers, but they are beautiful, and have a following for that reason as well as the typically more sturdy nature of their build. While cost is definitely an upfront factor, Airstreams tend to hold their value better than any other brand (which typically immediately begin to depreciate just as a car does). The biggest benefit of going with a travel trailer is that you will only have one engine to maintain. You can leave your house parked and drive around as you need to via your tow vehicle. If something goes wrong with said tow vehicle, you don’t lose your house while it’s in the shop being repaired like with a motorhome. The cost of purchasing a solid truck and paying truck mpg prices even when just running local errands are some of the downsides. Vandwelling means you live in a van. Not necessarily down by the river, but doesn’t that actually kinda sound nice?. A cargo van, a Class B motorhome, a Volkswagen Bus…these are all viable options for the minimalistic travel who prefers the lowest initial costs and the least to maintain over the years. My girlfriend, our oldest son and our German Shepherd lived out of a Volkswagen Bus for a year. We have done it for a few months at a time since then with two more babies. It can be cramped, but it can be very freeing as well. Setting up your rig is as easy as it gets, often only a few quick minutes of making a connection or three and if it starts to rain, well it’s no big deal to just pack up and go. Errands and having your home as a vehicle that can transport you to the trail are other pluses, and it’s very convenient to just have everything you own with you wherever you go–you never forget anything, because it’s always right there with you. An RV manufacturer takes a standard van chassis–something like a Ford E-250 or Chevy 2500, for example–and custom builds the entire back end of it. While they can be quite minimal, they often have a small bathroom and kitchen, some place to sleep, and more luxurious ones even come with TVs and satellite all types of fanciness built right in. You can typically plug these into electric and water hookups, if not also sewage, at RV parks, and they function as a very small motorhome. 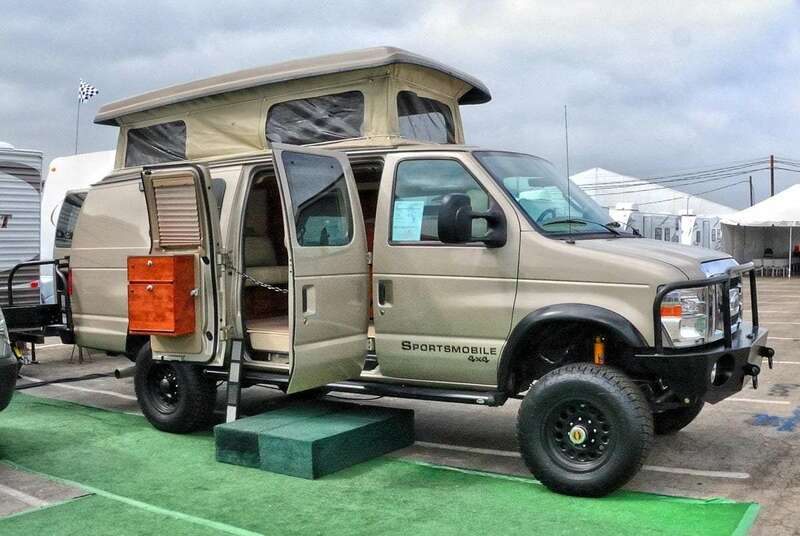 Companies like Sportsmobile can take a standard cargo van (again, something like an E-250) and kit it out into an outdoor adventurers dream machine. Four wheel drive. 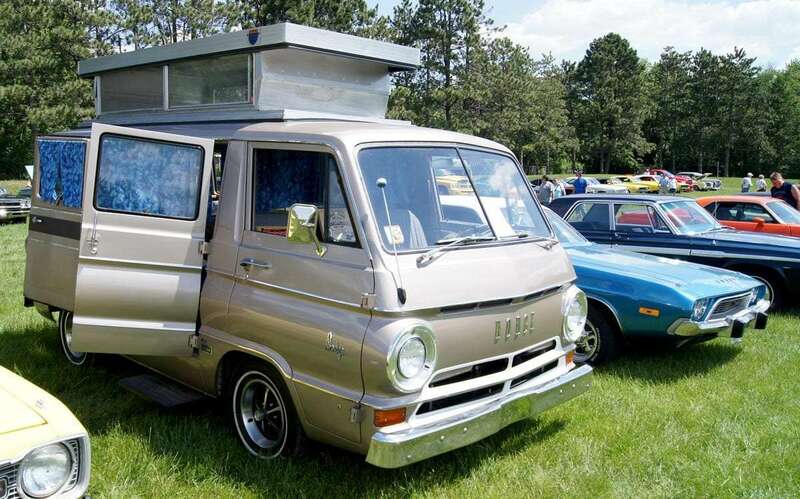 A pop top roof that transforms your easy to drive van into something with plenty of headspace, and often a top bunk for sleeping. A small kitchen is usually included. These are probably the most versatile way of traveling, especially if you plan on getting seriously lost in Montana or Alaska or something. They look badass, like Mr. T meets a moon rover, and have been a personal desire of mine for years now. They aren’t cheap though, and you could easily see your budget elevating into the $80-$100,000 range if you wanted all of the bells and whistles (including the initial cost of the van itself). The companies that do these conversion rarely allow you to use an old van, and the investment in all of the gear doesn’t make sense to do on something that’s on its way out, so unless you can purchase a used, already modified supervan, the expense if quite considerable. Our favorite way to travel is via a VW Bus. 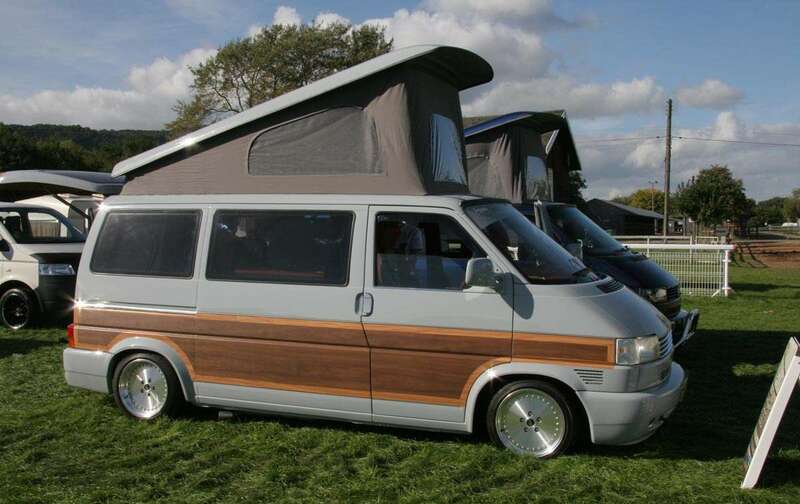 Most commonly a melding of any era Volkswagen Bus, Transporter, Vanagon or Eurovan and camping accessories added on by Westfalia, these are small, easy to drive (well, once you get the hang of it) campervans that fit into almost any tent spot or parking space back in town. Almost all of them have very similar features. A poptop roof that makes for headspace, additional light, and a top bunk to sleep on. The backseat / couch folds back to create another bed “downstairs”. A one or two burner propane stove, a small propane heater, a sink, and a cubic foot or so worth of fridge space. Many have electric and water hookups. Storage is not abundant, but often clever use of space means you aren’t exactly shy on room to stash your gear, clothes and food. The older they are, the cooler, of course, but even the 90s and early 2000s models of Eurovan are a practical way to live in a van with many of the amenities RV owners enjoy…but with better gas mileage and significantly less space. The biggest obvious drawback of living in a van is that you have very little space to store dishes, clothing, or anything else. If you can get past the small space, plenty of opportunities open up. For one, you can often get by with paying tent site pricing, and tent sites are almost always more beautiful and private than what you’ll find parked with the RVers. They’re also considerably more fuel efficient than any other setup, and your initial upfront costs can be much lower as you’re only purchasing one vehicle. You can also drive anywhere, in busy city streets, down washed out dirt roads, without worrying too much about clearance or whether or not you’ll get stuck somewhere there’s no turn around. Not that they’re for everyone, of course (you may need to get comfortable using public showers and toilets from McDonalds to Mobile stations), but given a realistic number of people, we would choose no other mode of travel. One of the hardest aspects of purchasing an RV that you’re planning on living in, especially if you’ve not spent much time in RVs in general, is knowing what to look for, how to shop. Say you’ve already decided on the type of rig you want to call home, next up is going out and finding one, doing the leg work to make sure it’ll suit your needs, and then inspecting it. RV dealerships probably come to mind when anyone wants to investigate how much their new home is going to cost. And that’s a great way to get started–looking at what all is available, and getting some free info from salesmen. When it comes time to make a purchase though, buying off of an individual is always cheaper than getting an RV from a dealership. What a dealer will give you is a completely walk through–especially if you look the part and portray an air of confidence that you’re going to buy an RV–of how everything from the propane systems to water filling/disposal work. You can ask questions about solar or just how a fridge works while driving. They’ll try and sell you everything and a little extra, but this is their job and I don’t personally feel bad about “window shopping” at an RV dealership. When you’re done getting acquainted with options, you can begin digging around on the Internet. Craigslist and your local newspaper can help put you in touch with local sellers. There are a ton of specialized and general online RV marketplaces, too. Trailer Life or get specialized with Airstream Classifieds or the VW Bus connection, the Samba. Firstly, don’t ever buy an RV of any type without first testing everything. Especially when dealing with individual sellers, they may not have all of the hookups you’ll need to test all of this stuff on their property. Make sure they do before you go, or arrange to look it over somewhere that you can test everything. It’s also best to check everything both hooked up and in “boondocking” mode. From appliances to water systems, propane to slideouts. Boondocking means relying on your RVs systems without being plugged into any dedicated water, electric or sewer systems. First, you’ll need to hook a hose up, one end attached to the water intake line on the RV, the other to a source of running water. This is called being “hooked up” to water, often also referred to as being on “city water”. After you’ve done this and the water is flowing into your RV, you should go in and turn on any faucets, including the shower. Flush the toilet, does it work? Water pressure should be equal to what it was coming directly out of the spigot you hooked your hose up to. Leave this all hooked up and the water running slowly in a faucet somewhere for a few minutes. Head back outside and locate your sewer outlet, looking underneath in the meantime, checking for any dripping or other signs of leaks. You’ll want to hook up a sewer hose to the rig’s sewer pipe if you have access to a drain…but if not, there should be no reason a seller wouldn’t be comfortable with you draining the water you’re putting into the vehicle right there in their yard–there shouldn’t, after all, be any black water in the unit when you buy it. Black Water is your sewage water–anything that goes down the toilet. Grey Water is everything else, runoff from the sinks and shower. There are typically levers to control whether you’re dumping just your grey or black water, or both at once. Test them individually and together, making sure everything drains with minimal (ideally no) leaking. It’s also good to take a look underneath the sink, and around the bathroom, to see what kind of plumbing the unit has installed. Most newer RVs will have Pex or some type of solid plastic plumbing. Make sure it all looks newish, or at least in descent condition. If you’re buying something used or vintage, redoing the plumbing–ie, ripping out a bunch of copper pipe and replacing it all–is not impossible, but it is very, very time consuming and not exactly cheap. Finally, after everything has drained out through the sewer pipe, find the RVs freshwater storage tank input and fill it up with water. Remove the hose from the “city water” connection you’d set up previously, and simply use that to fill up the freshwater tank via an opening somewhere on the outside of the vehicle (this varies depending on the type and model of RV, the owner should know though). Ask the owner where the switch to turn on the water pump (a small pump used in RVs to create pressure for your faucets and shower, only needed when using the freshwater tank; city water connections provide their own pressure) is located, and flip it. You should hear some amount of noise as the pump builds up pressure. Older units will be louder than newer ones, but if there’s a whole lot of noise or shaking, the RV may soon need a new water pump. Once the pump is running, test out the faucets again. They should all work, and how much pressure you have will be dependent on the quality and age of the water pump itself. Run the water out and again check for leaks as you drain it all back out through the sewage pipe. If both the freshwater tank and city connection work fine, and you don’t detect any leaks or issues with the sewer system, your water setup should be good to go! Most RVs have the capability to run directly off of a 12v battery (ie, a car or marine battery, for boondocking) or plug into a power source, such as 50amp or 30amp service at an RV park. There is typically a fuse box that deals with the 12v aspects of running off of the battery, and a breaker box that will be very similar to what you’re used to in a house, which controls any 120v appliances. Most of the lights and internal indicators (such as those on your fridge or any panels that display your water tank levels) will be powered by 12v. Many fridges can run on 12v power as well, or if not, propane when you’re not plugged into an electrical outlet. Air conditioners and standard wall outlets, such as you’d plug a toaster or cell phone charger into, will run on 120v, and so in most RVs these won’t be an option when boondocking. To test the 12 volt systems, make sure a good battery is connected to the RV (there is typically a storage compartment outside dedicated to holding said battery) and go in and turn on some lights. The more you check, the more confident you can be that everything with your 12v system works. Some RVs will also have cigarette lighter 12v outlets (like in your car) that you can test if you’ve brought the correct adapter (again, the same thing you can plug into the cigarette lighter in your car to charge your phone). If the 12v isn’t working, you can first check the fuses to see if they’re all good, and double check that the battery you’re working with has juice (they often won’t if they’ve been sitting in the RV for months without a charge). You’re then good to go ahead and plug the external power cable into an electric source. While most will have a three prong setup (both 30 and 50amps have a slightly different configuration) and so you’ll again need an adapter if you’re trying to plug into a normal wall outlet. If you are connecting directly to a 30amp or 50amp outlet (like at an RV park), make sure the breaker switch in that outlet box is turned on. Then check through the RV to make sure everything’s working. You can plug a phone into the outlets to easily test if they’re sending out juice. Fire up the air conditioner to make sure it’s working. Check the lights again, though if they worked off of 12v they should also operate perfectly well over 120v. If anything isn’t working, check the breaker box to see if any of the switches have been flipped. If everything does work, move on down the checklist! With your water and electricity all working well, the final major component is the RV’s propane system. Propane typically serves as fuel for your stovetop, hot water heater, possibly additional heaters throughout the unit, and your fridge’s backup system (so it can run even when you’re not plugged into an electrical outlet, such as while driving or boondocking). To test your propane, find where the existing propane cylinders are, or hookup your own to the lines. Propane lines typically screw in lefty tighty, righty loosey, the opposite of everything else in the world. Once the line is connected to the cylinder, twist the nozzle on top of the cylinder and you should hear a short hiss as propane begins to fill the lines in the RV. Head in to the stove, turn on a burner, and light a match. Sometimes it will take a few minutes for propane to make it all through the lines and therefore expel gas through the stovetop, but after two minutes the burner should be lighting. Test all of the available burners. Inside of the oven, there is typically a pilot light that needs lit to test it. Next, unplug your outside power cable (if it’s currently plugged in), and look at the control panel on the fridge. If there is an “Auto” setting, this typically means that the RV will use 120v power if available, or propane if it’s not. Otherwise, you may need to actually adjust the control panel to a “Gas” or “LP” setting. Do that, and listen closely. If you hear a clicking sound that continues for long periods of time, or any type of “check” light comes on, you may have an issue with the fridge running on propane. RV refrigerators can take several hours to get cold, especially if you’re starting from a completely warm state, so it isn’t always that easy to verify a working fridge. You could call ahead and ask the seller to get it started so you can be sure it works, but you likely won’t be hanging around long enough to witness the fridge get very cold – though if you do this test first, you may be able to feel some change in the elements inside of the fridge enough to verify it works to some degree. Finally, find the hot water tank heater access (usually accessible from outside of the RV) and follow any instructions there to light it. This usually involves turning a knob to “Pilot”, lighting a pilot light somewhere, adjusting the knob to “On” and then fiddling with a thermostat (often just a simple lever used to control how hot you want the water to get). You’ll typically hear and be able to visually see the flame if you’ve done it right and everything is working. Provided there is water in the hot water tank, within twenty minutes you should be able to feel at least warm water inside of the RV (turn a faucet on to hot). What else to look for when purchasing an RV? Electrical, water, sewage and propane are the primary systems. They power most of what you need to do your “living”. There are plenty of other little things you can test if you’d like. Many RVs have cable hookups (and RV parks often have a place to screw a coaxial cable into) and you could test if this is working if you have access to a television and a cable outlet. You probably won’t, though, but fixing a problem with a cable hookup is as easy as buying a long piece of coaxial cable, figuring out how to get it from outside of your RV to the inside, and screwing it in to your TV. Many units have small skylights that wind open, sometimes with ceiling fans inside of them to help regulate how much hot air is moping around in your rig. Built in radios, DVD players, and their ilk could be tested. More importantly, you’ll want to look at the RVs outside mechanisms. Does the roof feel solid? Typical motorhome should be able to support one or two guys up top with no issue, and often have a ladder providing that access. If the roof is squishy or soggy, you’re likely going to have leakage issues. 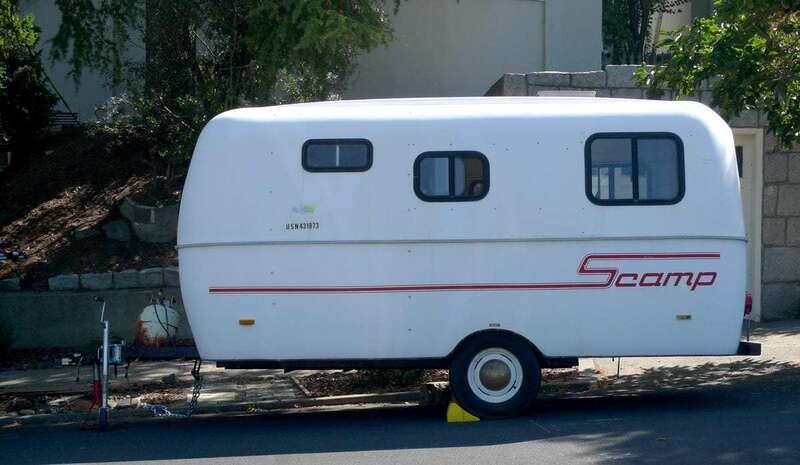 Note that trailers aren’t always designed to support the weight of a person, and common sense tells you that climbing on the top of a vintage Teardrop or Airstream will probably leave you with a hole in the roof of an RV you haven’t even purchased yet. Give the tires a kick or two. New tires come cheap for trailers, but you’ll want to hook up your vehicle to a trailer’s electrical connection (near the front, where you hitch up) if possible. Have someone inside of the vehicle apply the brakes. You should hear some type of noise inside of the tires, indicating that the trailer’s brakes are working. If they’re not, it could be a plethora of issues, but the first would be ensuring that your vehicle is wired for electric trailer brakes. Just because you’ve got the plug at the back of your truck, doesn’t mean it has all of the right wiring. You could even hook up the whole way and pull the trailer slightly, applying the brake in your vehicle to feel whether or not the trailer tugs back at you a bit. You may need to adjust the sensitivity on your tow box (the device inside of the cab of your vehicle that allows to you manually apply just the trailer brakes). If you don’t have one of these, you will need one before you do any actual towing. Smaller trailers may not have brakes built into them, but anything over 2000lbs should have their own braking systems, otherwise you may burn the brakes out of your tow vehicle in a quick and dangerous manner. You could also check the axles, which should typically be straight (though in vintage Airstreams, for example, the axles intentionally bend upward). Does the motorhome shift easily when going up and down hills? Most are automatic transmissions, so you can tell if it’s shifting by how high the RPMs rev as you begin to pull yourself up a steep incline. If you hear a bunch of clunking, you may want to get a professional opinion. Does the temperature gauge move at all? If you take the motorhome on a 20 minute test drive and the temperature gauge is climbing, imagine what it will do on a five hour haul through Arizona in August. Is anything leaking underneath? Do the brakes work well? Does the motorhome generally sit level (from front to back and side to side) when parked on a level surface? Many garages will be glad to look a motorhome over for you, at their hourly rate of course, but spending a hundred or two up front may save you thousands in repairs in the long run. Similar to the Kelley Blue Book guide to what cars are worth, NADA Guides provide current values of just about any type of RV, from vintage to brand new, truck campers to motorhomes. 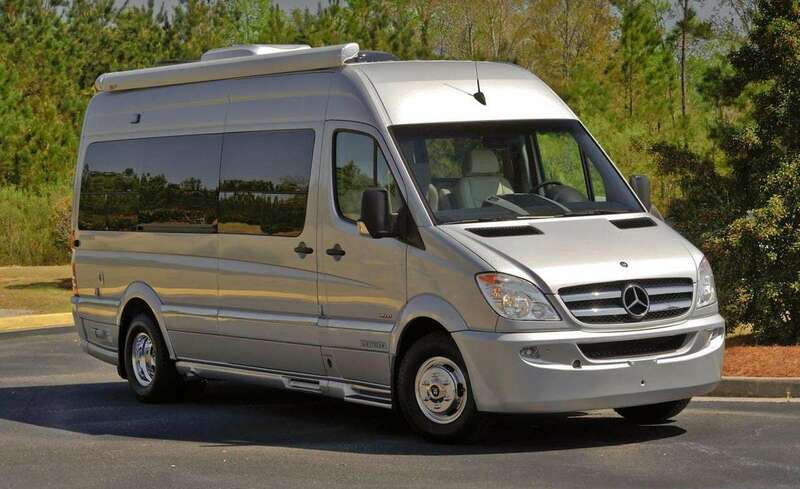 You can start there, but a more realistic way to see what you should pay for an RV is to look at similar models being sold in your area, or around the country if you can’t find anything similar locally. Then think about the repairs that would need to be done to this particular unit: major systems like propane, electric and water are a big deal to fix. Leaks in the roof are a big deal. Bent axles, slipping transmissions, overheating engines. These are the things to factor in. Whether you like the mauve couch is not. Replacing a fridge or a stove is not as big of a deal as replacing a shower. Anything that needs done to the unit will be an additional cost, so factor that in when attempting to negotiate. Oh, and rock cash. Sellers are typically way more likely to make a deal when they see a pile of green right in your hand. To them, it signals “I could have this money in a few minutes” vs. the uncertainty of checks clearing and the unlikelihood they’ll be interested in waiting for you to get financing. There is an amount of pride one can take in owning something vintage. You are reusing something old that may have otherwise become just another pile of scrap metal. You’re living in a vehicle that has loads of experience, more than you most likely, at least from a traveling perspective. They are conversation starters, sometimes friend makers. They’re also a ton of work. If you purchase an already restored vintage trailer or motorhome, it will cost you sometimes even more than a brand new modern rig. If you pick one up that needs a good amount of love, you will need to spend months getting it ready to go. That can also add up to quite a few dollars, depending on how mechanically inclined you are or are willing to become. The Internet can help with that, though. Buying used means you can invest some amount now, and smaller amounts down the road as you go. Buying new likely means a loan that you’ll need to be able to pay back while traveling. It means more stuff that just works, and less of your time spent fixing when you want to be out exploring. 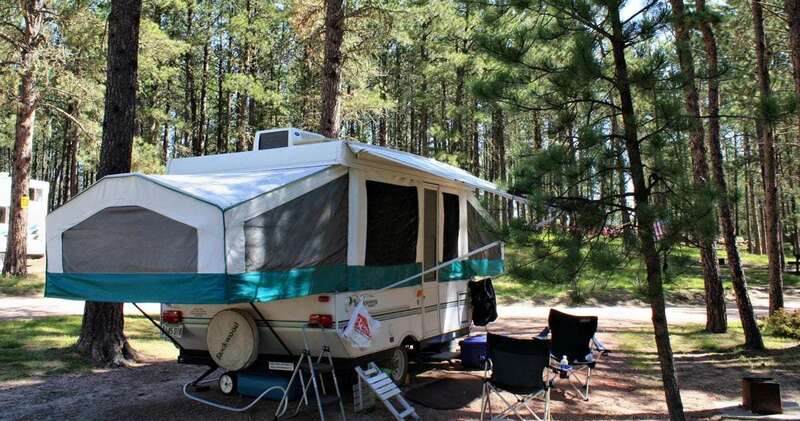 There are even some RV parks which require guests have a rig that is no older than 10 years. Exceptions are often made for well maintained classics, and these places are rare, but they do exist. I personally prefer vintage, but I’ll also admit there’s some amount of vanity behind that. I want to be the guy with the interesting house. Your personal preferences, and how willing you are to invest up front money or longterm time, will best determine what you are most suited for. You could also take the middle road, and buy a used, older RV, which gives you the best of both worlds: possibly less longterm maintenance and less upfront cost. 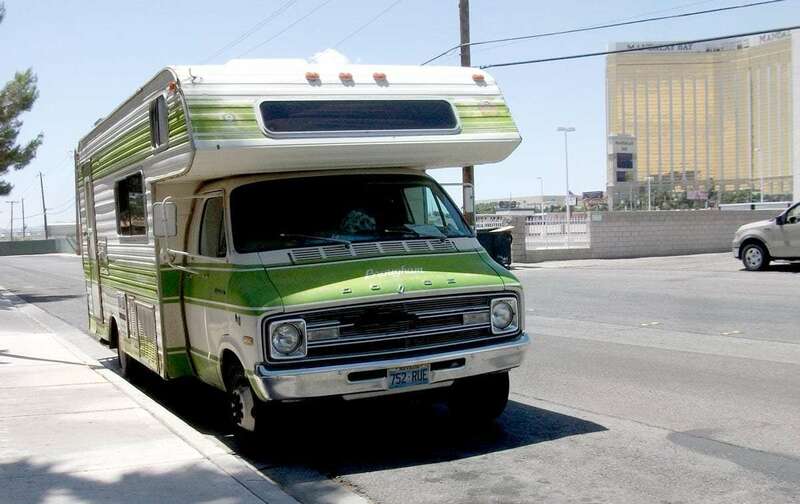 Adversely, you’ll also be getting what will likely be a rather ugly RV with outdated furnishings. How much all or any of that matters is only for you to decide. While the input above is somewhat riddled with my thoughts on the various types of RVs, I have tried to be simple and blatant with what each unit will afford or restrict. My personal opinions are my own, and as a minimalist and after more than six years on the road, I do have a tendency to need less and make more of what I do have than perhaps those first transitioning into the RV lifestyle, but I feel the need to share them anyway, in case they may help you make a decision as a rookie that could last you well into longterm traveling. 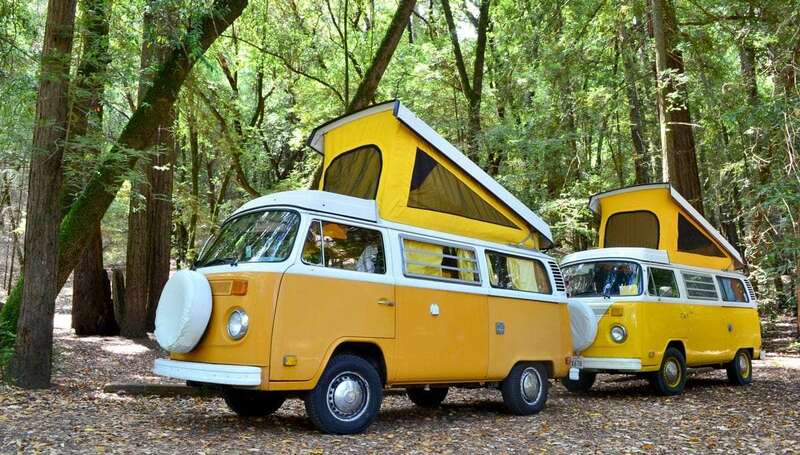 If I were alone, or a couple, or even if it were just my wife, myself and our two youngest children, we would be living out of our Volkswagen Bus. No toilet or built in shower is annoying, but the freedom a tiny house provides and the ease of setting up and tearing it back down, not to mention the vintage cred and sheer awesomeness of VW Buses, make it my number one choice for this lifestyle. It also means almost all of your time spent outdoors. Rainy days can feel a bit claustrophobic with two or more people stuffed into a mini-van’s worth of space. And they require a lot of work to keep them up and running, but that’s where I stand. 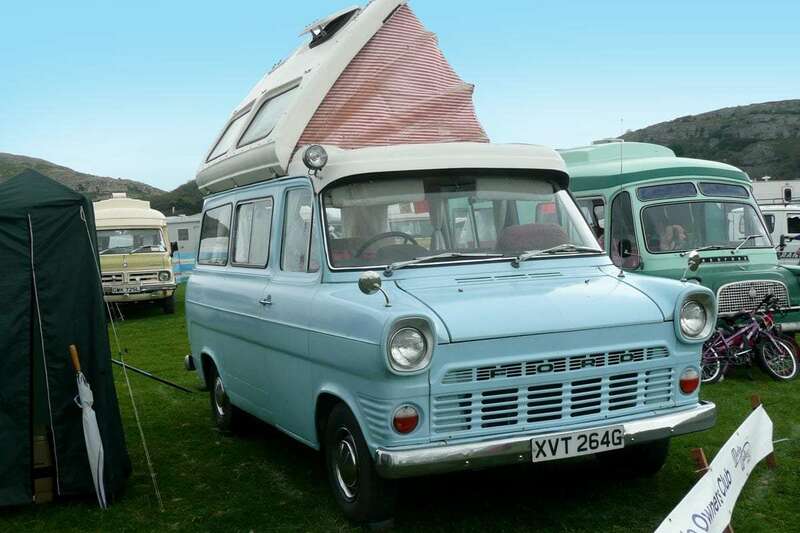 Even a newer Eurovan or a Supervan would be preferable, for me, over any type of motorhome or trailer. 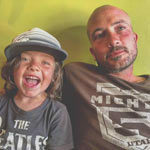 We currently live in a combination of a Ford E-350 extended cab van and a 31′ 1976 Airstream travel trailer. There are six of us and a dog, so the extra space is nice. But it’s a lot to tow around, and we feel it at the pump. Clearance on these older Airstreams is not great, and so you are limited by the terrain of the campground you’re in. Vintage always means more maintenance, more projects that keep popping up. 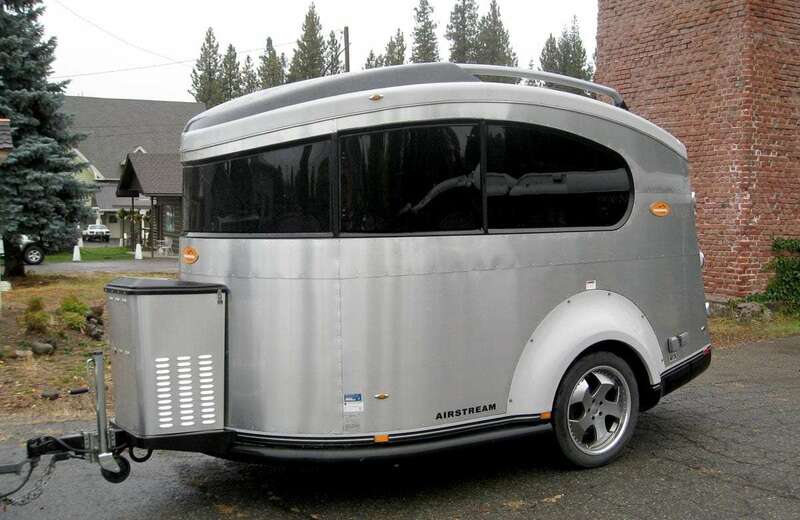 Still, I would choose Airstream over any other brand of trailer any day. Like with VW Buses, there is a following, a community around these silver tin cans on wheels. Whether online or in rallies held all around the nation, all year long, you can meet up with fellow travelers who at least have the desire to hit the road and a specific type of trailer to do so with in common. They represent quality, look cool, and help to strike up conversations. I have also noticed that most people who full-time it in a Class A motorhome, huge fifth wheel, or other large RVs, well, they do tend to stay inside a lot. Sometimes you’ll never even see them, until they come out to unhook their sewage pipe and drive away. To me, the point of all of this traveling is to get out and do stuff. Having less space to live in just provides more incentive to go out and actually live, so dragging around a big old house on the highway (and being restricted to large pull through sites which typically have little shade or trees of any sort) just doesn’t appeal to me. Not trying to be a snob, but the great outdoors is why I do this. To see, to experience, to actually be involved with this planet we live on and with. I find that the smaller the apparatus you use as your base camp, the more you explore. Though downsizing from a 1500 square foot house to a 170 square foot RV may seem like a massive adjustment to the more minuscule side of life, most people I talk to on the subject relate that they would like to go even smaller. Smaller means easier to drive around, more options as far as which roads you can take and which campgrounds or sites you can stay in, better fuel economy, and in general, the traveling life tends to lend itself very well to those who can make due with fewer possessions. Of course, just because you start with one rig doesn’t mean you’re stuck in that mode of transportation forever. In the six years I’ve been at this, I went from a Class C to a VW Bus to an Airstream, through two different tow vehicles, and am still dreaming away about that Supervan! Can I Really Share My RV and Earn $10,000 To $30,000 A Year? Similar to AirBNB, RVShare is a service that allows you to rent out your RV or rent someone else’s–make cash if you’re not using yours, or use the service to take a few different types of RVs for a spin!